There are two very important concepts that one of my favorite managers gave me. Bryan Hathcock was a senior Systems Engineer (SE) Manager for IBM when I showed up in the late 1970’s. He became a mentor and a good friend and still is today. I learned a great deal about managing effectively from him. The very first week at IBM, Bryan began coaching me and molding me into a strong SE. His management style was persuasive and not authoritative. He was more comfortable in pointing out the direction for you to take than micromanaging an employee on how to do everything. To say he empowered me to do the job is an understatement, , , I learned a lot about empowering employees from him. In the first week, he gave me some advice that I still adhere to today. It has been something that has made a real difference in my career as a manager and professional, possibly even as a human being. I know that may sound quite strong, but I believe it to be true. The context of these words of wisdom was when he was telling me about his plan to pair me up with senior SE’s and Marketing Reps over my first six months at IBM to learn about the business. He suggested that I would see some very different, even unique, approaches to dealing with various customer issues, opportunities, and problems. Bryan’s advice was to observe how different people go about their business and when I saw something that worked well and was a strength, to incorporate this approach or skill into my own way of handling situations. As for those things that do not work well, exclude them from your repertoire. I took this advice to heart and to this day I still observe others and learn from the actions of others. You might say that over the years I have been a “student of management”. I pick up sound management techniques from all types of sources. It might be from a management situation I observe taking place, from a movie, even from my wife who makes comments about a situation. Management situations occur all over the place; I tend to look for these situations and learn from them. One of the best examples of management in a movie is in the first five minutes of Gladiator. If you are looking for it, you learn a lot from a very short segment such as things like respect, commitment, motivation, strategy, and leadership. Don’t laugh, I see every one of these concepts every time I watch this part of the movie. When I need a morale boost, I put my Gladiator DVD in the box and watch just 5 minutes of the movie. It’s great because I’ve identified 15 management traits from the first 5 minutes..
Bryan gave me another piece of advice at the time I was about to leave the SE organization and move into the Sales organization. Part of my career path was to become a Marketing Rep after three years as an SE because having sales experience would be beneficial to my future career as a manager. In one of our last meetings as Bryan’s employee, he gave me some extremely good advice that I’ve used in counseling many of my employees over the years. What he meant in this case was that I needed to drop the technical skills and focus I had on technology from my SE experiences once I became a salesman. 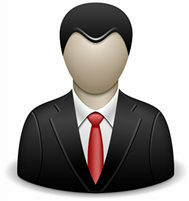 Having strong technical skills is not what will make you a good salesman. It certainly won’t hurt, but if you continue to focus on the technology, you won’t be developing your sales skills and doing things that are going to make you successful as a salesman. This is some of the best advice I have ever had in all of my career !! I believe this advice is what helped me eventually leave the technology behind when I became a manager and focus my full attention on what it takes to succeed as a manager. It was a very difficult transition for me just as it is for most of us who are initially technical experts who become IT managers. 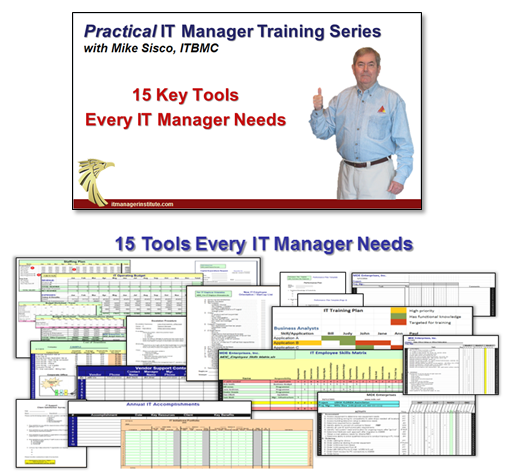 The problem, of course, is that as an IT manager, you simply don’t have the time to maintain your technical skills at the expert level and also do what you need to do as a manager to be successful. If you don’t focus your time and energy on management issues and in developing the skills that are needed in this discipline, your team and company suffer and your organization’s results will not be to the level they should be. 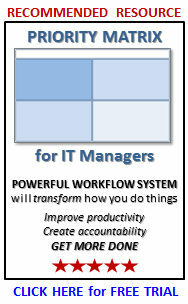 Managing an organization is totally different than managing technology issues as a technology expert. All of a sudden, you have to get things done through other people and not yourself. This was probably the hardest part for me to learn because I was so used to doing things myself and only being accountable for myself. It is one of the more difficult transitions for all of us to make and it is possibly the most important aspect of becoming an effective IT manager. 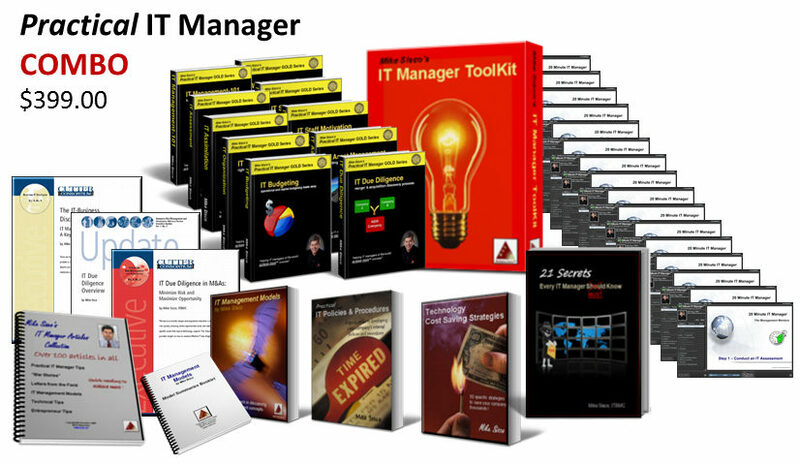 Management is a full time job and so is being a technology expert. Both disciplines can be very rewarding for a person, but it is very difficult, if not impossible, to be effective in both areas. I learned a lot from Bryan, but these two concepts have probably been the most important in helping develop my career. I continue to observe others all the time and learn from them. I look for management situations that add value to my existing skills and understanding. When I take on a new role, I quickly try to focus on what’s important to be successful in the new role rather than focusing on what I know from my past. I keep the past in the background and use these experiences when they are helpful, but the concentration and focus is placed on developing skills and dealing with issues that will make me successful in the new role. Incorporate these two pieces of advice Bryan gave me in your own approach and you will find that they will benefit you for years to come.